Sadness descended over our club this week with the very sudden passing of the hugely popular Trevor Burton. The club would like to thank everyone in attendance last night for the way they observed the short tribute to Trevor. It was very moving and difficult evening for many of us in the club. 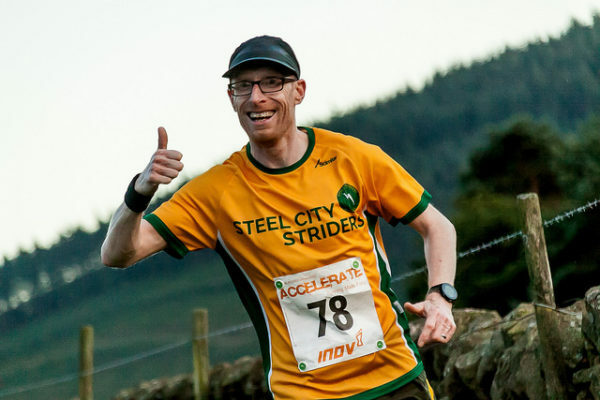 A beautiful summers Friday evening set against the backdrop of Derwent Reservoir was the location for the annual Steel City Striders Salt Cellar fell race. The race forms part of the season long Accelerate Gritstone series and once again gratefully supported by Accelerate, Inov-8 and Just Natural at Crookes. A mention must also go to Edale Mountain Rescue who are always there if we need them. As always, all proceeds from the race will be donated to Edale Mountain Rescue. Final word of thanks has to go to all the Steel City Striders members who volunteered for marshalling duties. The committee and race organisers can’t thank you enough, as without you there would be no race. Thank you everyone for your continued support towards this great event. 201 runners took on the challenging 7 mile course with Alasdair Campbell of Buxton coming home first in 52:36. Kim Baxter of Dark Peak was first lady past the post in 1:02:46. Full result with category breakdown can be found on the webscorer website.